The Board of Directors is composed of 8 representatives scientists and 7 representatives from member companies for a total of 15 board members. Four board members are elected by the Board of Directors to serve as the President, Vice President, Chairman, and Vice Chairman. Board members serve three-year terms and are eligible for reelection after their term ends. Reviewing and developing ILSI Taiwan programs and activities. Establishing, amending, and managing internal bylaws and affairs. Reviewing and approving budgets and finances. Raising, managing, and utilizing funds. Hosting elections for the Board of Supervisors and the Board of Directors. Electing the President, the Vice President, the Chairman, and the Vice Chairman. Approving board member, President, Vice President, Chairman, and/or Vice Chairman resignations. Hiring the Executive Director and handling other human resource affairs. Nutrition Society of Taiwan Creation Food Co., Ltd.
Graduate Institute of Food Science and Chien Cheng Trading Co., Ltd. The Board of Supervisors is composed of 3 scientists and 2 representatives from member companies for a total of 5 board members. One board member is elected from within the Board of Supervisors to serve as the Managing Supervisor. Board members serve for three-year terms and are eligible for reelection after their term ends. Supervising the activities of the Board of Directors. Supervising the activities and development of ILSI Taiwan. Supervising spending and reviewing annual budget reports. Approving board member and/or Managing Supervisor resignations. Technology, National Taiwan University Toong Yeuan Enterprise Co., Ltd.
Department of Food Science, Grape King Inc. 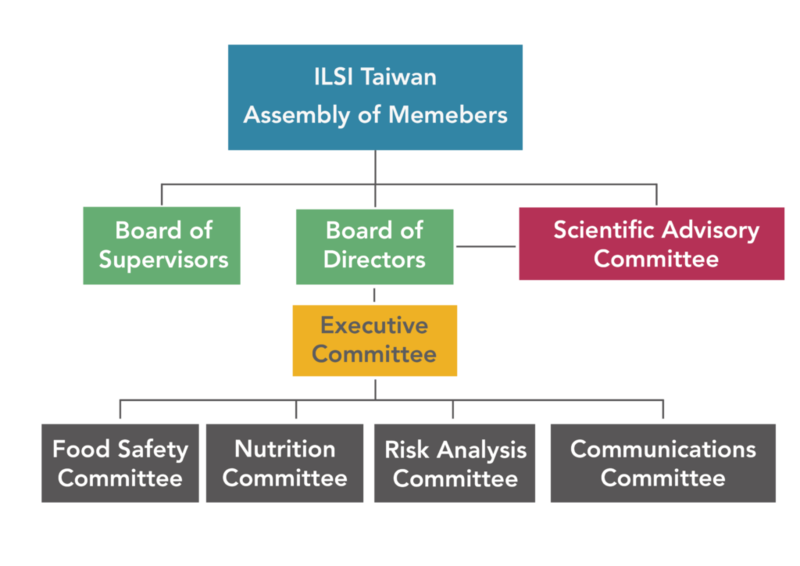 The Scientific Advisory Committee is responsible for providing development strategies, implementation plans, and other academic expertise for ILSI Taiwan’s scientific programming. Given approval from the Board of Directors, the Scientific Advisory Committee may form additional task forces or working groups. The committee is composed of a maximum of 10 experts appointed by the Board of Directors. One committee member is elected by the committee to serve as chair of the committee. Committee members serve for the same term duration as the overseeing Board of Directors. At the end of the board’s term, the new board may choose to reappoint committee members for an additional term. Taiwan Association for Food Science Examination Yuan of R.O.C.